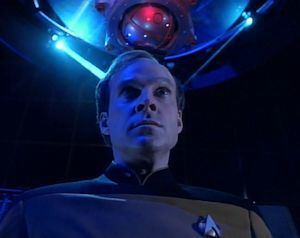 After an encounter with an alien probe, Lieutenant Barclay grows super-intelligent and takes control of the Enterprise. I'm glad we get to see Barclay again, and I like how the opening scene is a fake-out, making you believe that he's on the holodeck--as we would expect--when he's actually acting (badly) in a play. It shows that, even though he is a recurring guest-star, the writers are willing to develop him from one episode to the next. Instead of the character being relegated to just wacky comic relief, you actually kind of root for him to overcome his social awkwardness. The story plays on that, though, because when he does overcome his awkwardness early in the episode, we know something has gone wrong. They use phasers instead of photon torpedoes when the probe is chasing them, because the Enterprise wouldn't be able to withstand a "blast" from such a small distance. However, as they are actively trying to destroy the probe, wouldn't the probe's explosion hurt them even worse than a single torpedo explosion? I love everybody's reaction to Troi admitting that Barclay made a pass at her. The story is serious, but there's a really amusing undercurrent that works, simply because such a goofy character has been turned into his most absurd opposite. "I'm afraid I can't do that." Nice homage to 2001, which continues in the next scene when the crew has to find a place where they can communicate without the computer monitoring them and the scene after that when La Forge is crawling through the guts of the ship to shut it down. Again, the writers show their respect to Sir Arthur C. Clarke. When Barclay says he has reduced existence to a single equation, how come nobody asks him to transcribe it? That would be a pretty nice nugget of information to have. The seemingly omniscient aliens are just happy, curious gurus who mean no harm. It's the perfect capper to a story that messes with your expectations, because as the episode builds, it feels like it's leading somewhere ominous. I really enjoy this one. It's like Star Trek's answer to The Lawnmower Man, but in many ways, it's a more thought-out plot with a more satisfying conclusion. Number of episodes in which a member of the crew is subverted by an alien lifeforce: 15, and it's the third in a row. The same actor who plays the holographic Einstein in this episode, Jim Norton, plays him again in "Descent." When Barclay demonstrates how to travel through subspace in a new way, why doesn't anybody study his methods later on and learn from them? Similarly, at the end of the episode, Picard notes in his log that the Cytherians have shared technological and scientific advancements that will take Starfleet a decade to fully unravel, and yet we never see the fruits of this superior technology.